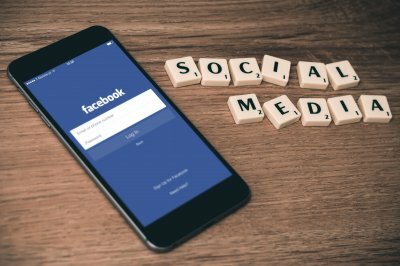 I still run across curmudgeons who flat out reject techniques like object-oriented programming (especially inheritance and polymorphism), protocols and protocol-oriented programming (especially composition), generics, and closures. On a conscious level, the curmudgeons usually reject these technique because of their supposed “massive” performance cost. On a subconscious level, the curmudgeons don’t understand these technologies. So do we give up all hope or do we accept the fact that compiler designers have come up with brilliant optimizations that ameliorate the use of such high-level technologies? We should believe in Swift’s compiler designers. 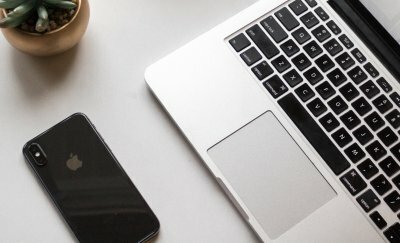 Do we realize that there are great tools like Xcode Instruments that help us find awkward implementations of these techniques and give us the opportunity to come up with our own optimizations? Yes. There are costs to these high-level features, but I would argue that in most cases, language compiler optimizations, operating systems enhancements, and faster hardware (like solid state drives and multi-core processors), make up for the costs. Sure, once in a while you’ll have a use case where advanced code features don’t pay off, i.e., code is badly written or not used for the intended purpose. Most of the time, these advanced features save software development boutiques enormous amounts of time and resources. Advanced language features usually let us do more by writing less and very expressive code. Time is saved because team members can easily read each other’s semantically clear code. Since the code is readable and logically organized, it can be extended, reused, debugged, and maintained easily. But by goodness, nobody’s perfect, not even me ;-). Software keeps getting more and more complex. Users keep demanding more, better, and faster features. Problems will occur. Some apps are so slow that people just delete them. Do we find out why our apps are so slow by using just print statements and breakpoints? I hope not, but I’ve seen more than a fair share of Stone Age “optimization” techniques. No. We turn to the darn good tools that already come bundled free with Xcode. We’re going to use the Time Profiler to analyze the performance of my sample app’s code. Please download it from GitHub. 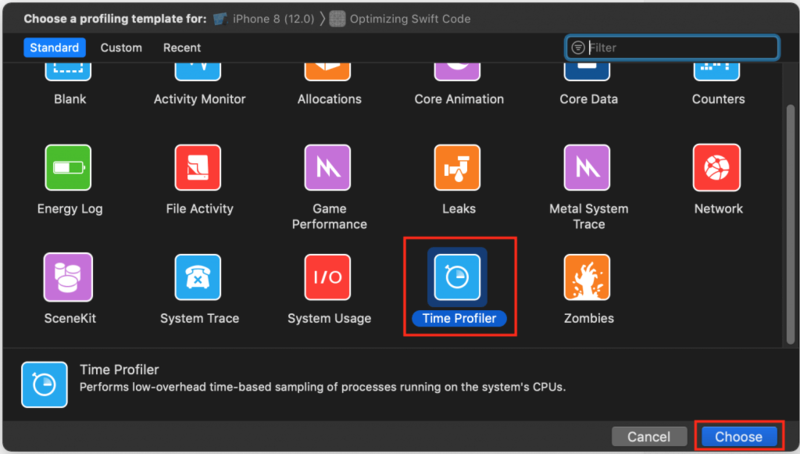 In simplest of terms, Time Profiler collects information about your app while it’s running, determines how long each of your functions takes to run, and also figures out the percentage of CPU cycles each of your functions is using. It gathers the same data about iOS SDK functions. The percentage of CPU cycles from 0% to 100% at each sample point is shown over time on a graph called the “timeline” or “track.” There are multiple tracks. The top track aggregates all the data from all individual thread and CPU core tracks. The Time Profiler is a very powerful tool as it shows your app’s performance in real time, thus reflecting surges or lulls in CPU usage. We’ll walk through an example. Before we begin, realize that, when profiling your code, especially when comparing two different approaches to the same problem, it’s imperative that you compare apples and apples, not apples and bananas. In other words, if you’re profiling an algorithm and trying to optimize it, you want to use the same device (or simulated device) with the same configuration. When I compared the performance of functions showEmployee() and show() from my sample app in the demo below, I ran and profiled each method on the same iPhone 8, with the same configuration. When preparing my iPhone 8 for profiling, I first shut down all running apps. Since the code I was studying didn’t involve any type of connectivity, I shut down WiFi, Bluetooth, and cellular. Of course, if you’re profiling networking code, like communications with a REST API, you’ll need to have WiFi or cellular. The key takeaway here is that you want to minimize, preferably eliminate, the number of (random) variables that may skew Time Profiler analysis and results. Imagine if you’re profiling an algorithm and your iPhone starts up Background App Refresh… Your analysis may be tainted — artificially skewed so that you believe your algorithm is slower than it really should be. Imagine if you profile one algorithm when nothing is running in the background on your iPhone, profile a similar algorithm while your iPhone performs a background refresh, and then compare the two results (data sets). Is this a meaningful comparison? I’ve numbered my annotations to correspond with the general sequence of the workflow you use to analyze app performance. I’ll also refer to these annotations in the following discussion. When you click on a single time/data sample or highlight a slice, the corresponding code executing at that time of that selection is shown in what I annotated on my map as the “4 – Heaviest Stack Trace,” “5.1 – Stack trace of method names (tree),” and “5.2 – Measures of CPU used.” You all should know that functions are pushed on and popped off the stack, that functions calling other functions builds a stack trace, and that “Heaviest Stack Trace” means high CPU usage (cycles). – thick, high, and blue activity on the top track, or possibly in thread and core tracks. After I’ve selected a slice of the timeline, here “Region 1,” I first look at the “4 – Heaviest Stack Trace” pane (see map) for method names I recognize with a person icon next to them. The person icon indicates my code; other icons represent iOS calls. The “4 – Heaviest Stack Trace” pane shows me code with high CPU usage. But… I don’t have to switch to Xcode to look at my code. Look at all that information. You can even see ARC memory management in action, like retain and release statements. Note that ARC has overhead, so when using classes (reference types), you may have to carefully architect your code — and possibly optimize it. 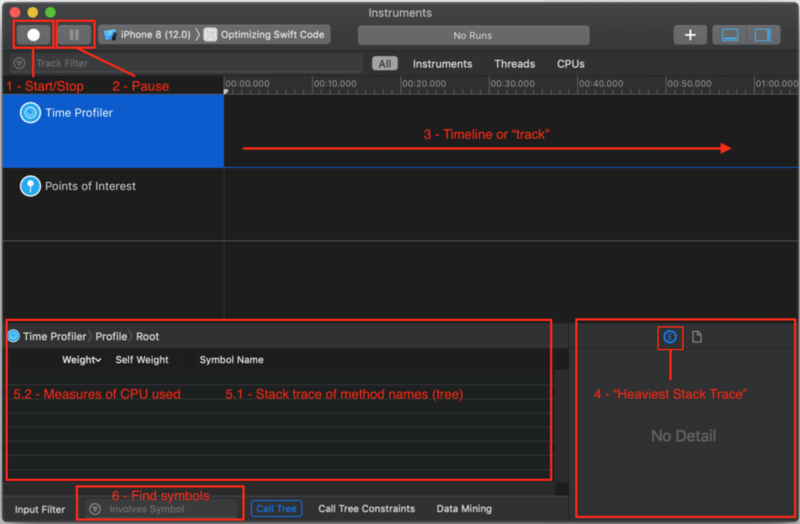 Now that you have an idea of how the Instruments’ Time Profiler template works, let’s look at optimizing some Swift code. Those busy Swift compiler engineers have done a great job of making Swift fast and light-weight. Back in Swift 2.0, there were more opportunities for developers using the language to optimize their code. With the release of Swift 4.2, the compiler is pretty darn optimized — but that doesn’t prevent people from writing bad code. Still, developers need to legitimately optimize code, especially code in which there are complex relationships, mountains of data, and/or extensive calculations. Let’s look at an example involving dynamic dispatch. 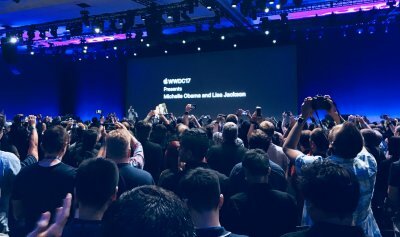 I urge you to pause at some point while reading this article to take a look at an excellent Apple Developer blog post entitled “Increasing Performance by Reducing Dynamic Dispatch”. You should understand dynamic dispatch by now, even the Swifties, but especially if you used to develop in Objective-C.
My sample code is not Earth-shatteringly innovative, it’s not supposed to be. I’m using a simple example so you can understand the language concepts and optimization tools. Remember “6 – Find symbols” in my map? I ran multiple profiling sessions, several to investigate showEmployee() and several for show(). Hey, call me a stickler for details, but I don’t trust one data sample. I’ve got two math minors with an emphasis on statistics, so yes, I profiled multiple times to make sure my claims were substantiated. I’ll present two representative samples from my research (and yes, I switched out of dark mode because my eyes were getting tired). What I found was that Employee.showEmployee() is conservatively about 2.5 times faster than Employee.show(). Yes, I know… Is saving less than a millisecond really an optimization? In this app, no. If you’re working on some app that repeats a call millions of times, maybe optimization by taking out dynamic dispatch would be worth your effort. Remember earlier that I said that the Swift compiler is getting really smart? As I understand it, the optimizations that I’ll discuss from here onwards are already turned on by default. Even so, I believe it’s instructive and helpful for you to understand what the Swift compiler is doing with your code. Compilation Mode is set to Whole Module for Release. Optimization Level is set to Optimize for Speed for Release. That makes for fast apps that you publicly distribute. Profiling this and many other projects for customers, I’ve seen Whole Module Optimization speed up my public releases. In fact, the changes I made to enhance performance in the previous section were done in Debug. When I removed the final keyword in Release, my profiling seemed to confirm that the Swift compiler inferred it as an optimization. NOTE: You should still consider applying the final keyword to both class properties and methods when performance is critical. You can always use Instruments to determine if your “optimizations” are indeed optimizations. There’s one language feature where Whole Module Optimization has an additive effect on another one. We’ll discuss this in the next section. The compiler looks at this function and realizes that “it must be able to handle any type T” that conforms to Equatable. Think about the complexities involved in generics. You’re writing code that ideally should be able to handle any type. Swift already supports an optimization called generic specialization. It turns out that Whole Module Optimization also optimizes generics. Why? I know this is a relatively old video, but you should watch the whole thing to find out. I proved to myself that Whole Module Optimization sped up calls in my sample project to my exists generic function. I profiled the project with Whole Module Optimization on and then profiled it with the setting turned off. This is how you learn about powerful tools. Say you’re designing a data-intensive app and you need to pick the fastest data structures to use in your code. Go to a site like this one, look at the Big-O complexity chart, review the data structures, and look at the time requirements of their operations. Then pick the data structures that balance your requirements with speed. ARC memory management has overhead, but I’ve read multiple scientific and commercial journal articles that do not conclude that reference types and reference semantics are slower than value types and value semantics. In my own work, I’ve never been able to prove that, in general, one was faster than the other, as long as sound best practices were used in development across the board. While writing this article, I actually coded an entire Swift project that performs the same task by 1) entirely using reference types and semantics and 2) entirely using value types and semantics. After multiple sessions with the Time Profiler, I couldn’t find any significant difference between the two. Nevertheless, I’ve seen scenarios in which ARC did degrade performance when misused, for example, creating too many references, or using large numbers of reference types when value types could be used instead. One has to strike a balance. For example, if we replace a bunch of references with values, what happens when we have to constantly change and copy those values? 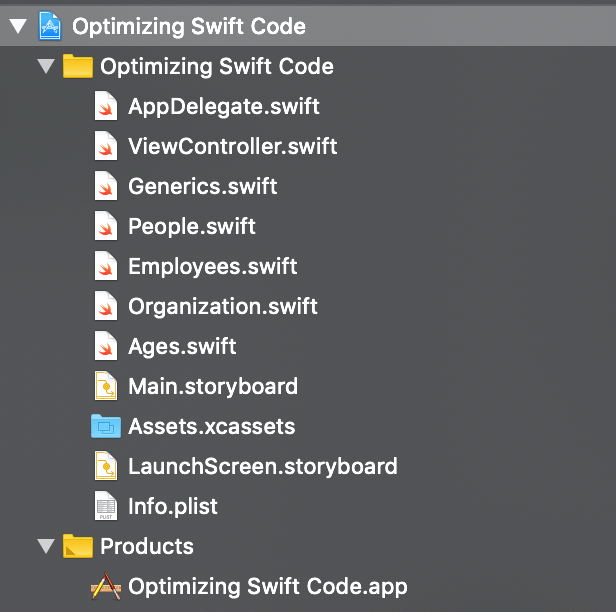 I encourage you to play with my project’s Swift code and its Swift Compiler – Code Generation settings — and then practice with the Time Profiler to analyze and possibly optimize the code. If not my code, use your own code. But practice, practice, and practice with the Time Profiler. You need to be able to find bottlenecks in your code and then be able to optimize them. You’ll feel a bit overwhelmed if you’ve never used Instruments before. I’ve been using its templates for years and still find it a bit overwhelming. But not using Instruments is a travesty. It offers so many ways to solve problems more easily than using brute force. By brute force, I mean only fixing bugs and making optimizations by using print statements and maybe some breakpoints. Please don’t give up on tools like object-oriented programming, protocols and protocol-oriented programming, generics, and closures just because you’ve had a few bad experiences or because you heard they have “high overhead.” When used right, these tools can actually reduce the amount of code you write and speed up your apps. They can certainly help with code maintainability, readability, and reusability. You have excellent tools with Xcode. Use them.